You may be thinking about Halloween costumes now, but Movember will be sneaking up on you sooner than you think! Whether you have a moustache or not, this important month is dedicated to raising conversations about men’s health, all while having a lot of fun. As Movember has grown exponentially since its beginnings in 2003 (it now has approximately 5 million participants worldwide), you can count on finding a local ‘Mo festival near you. We’ve done the grunt work for you and have found some of the most notable Movember celebrations across the country. And should you prefer to get involved from the comfort of your own home, remember to enter our ROYALSHAVE MOVEMBER GIVEAWAY! We have 4 categories and we’ll be awarding a prize to the winner of each one! In addition to the chance to win some primo moustache, beard, and shaving supplies, we will be donating $5 for each participant to the Movember Foundation. Now that’s a win-win. Get your face prepped for Movember moustache growing – or keep your ‘stache looking fresh – at Flo’s Chop Shop at the Portland IMS, Sacramento Cal Expo Center, and the Long Beach Convention Center. More than 50% of men don’t meet the recommended federal guidelines for physical activity. Get yours in while raising funds for the Movember Foundation at the TCS NYC Marathon in Staten Island. Contact Tom at tw@movember.com to join the team. Held at laid-back German beer garden Frankford Hall, the Shave the Date event will feature hot shaves for gentlemen, food and drink specials, and entertainment (plus it’s family friendly!). Celebrate Movember with your fellow moustached folks at FM 94/9’s Movember Party, featuring contemporary music and dancing. A moustache-themed marathon open to guys, gals, and kids. Proceeds benefit the Movember Foundation, and you’ll be amply rewarded after all your hard work with a t-shirt, moustache finisher’s metal, and access to post-race festivities. 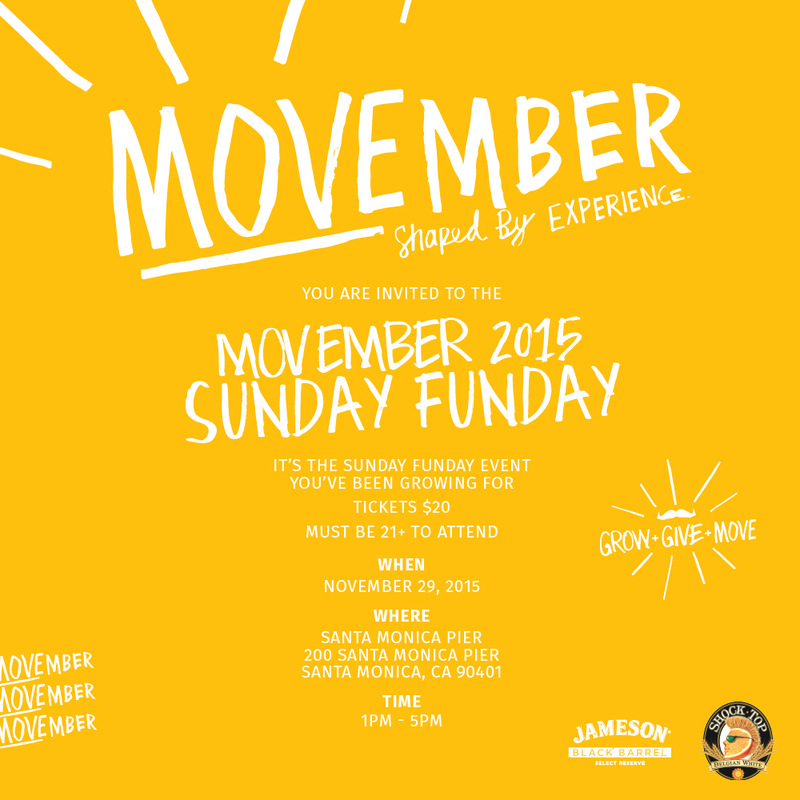 Celebrate the last nights of Movember with Sunday Funday at the Santa Monica Pier. Expect a bar operated by Jameson Black Barrel and food. « Enter the RoyalShave Movember Giveaway!